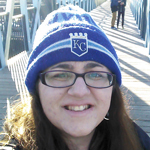 As I headed northward to Minneapolis for the international convention with three other Sigma Tau Delta officers from Kansas State University, I wasn’t really sure what to expect from the weekend. I’d been to other conventions, but never one so academically oriented. I was nervous about presenting my poetry, but also about going on a trip far from home in a city I’d never seen before. By the time the gala was in full-swing on Saturday night, I had learned so much at the convention, and had so many laughs with my fellow chapter members as I got to know them better that I couldn’t imagine not having come at all. Sitting at the banquet, surrounded by Sigma Tau Delta members from a multitude of different places and backgrounds, and hearing about faithful members of our 92-year-old organization, I realized I wasn’t just a member of a lesser-known group at my university. It struck me that I was part of a tradition of people who appreciate literature, writing, and learning just as much as I do, and that there is incredible value in that realization, and in those pursuits. Before the banquet, I also did some exploring of my own, and walked from the Hyatt through Loring Park, past its frozen ponds, to the Minneapolis Sculpture Garden. Many of the sculptures have been removed in preparation for renovations, but what I enjoyed most about the visit was the Irene Hixon Whitney Bridge, built in 1988. The bridge runs over the frantic highway and offers wonderful views of the Minneapolis skyline and the Walker Art Center, but the steel and wood structure itself was especially beautiful in the late-afternoon light that created ever-growing shadows. As I prepared to return to the hotel for the gala and the convention’s end, I realized there were words written across the top inner structure of the bridge. On my small adventure on the weekend of our English convention, a fifteen-minute walk away from our panels and discussions and celebrations of our community, I found an unexpected poem. It’s a commissioned poem by John Ashbery about connections, and choices, and place. 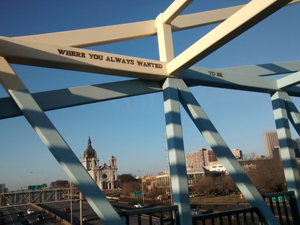 One of the pictures I took of the poem’s lines on that bridge still stands out to me. Smiling, I walked back to the convention.